Hi guys! I had every intention to post last night, but I had to go to a neighborhood get-together which lasted much longer than I expected. I don't have many plans this weekend, except for going to an Origins party. Influenster is promoting their newest release, and they inviting people for a VIP party (whatever that means). Tonight I have a polish that was released a few years ago from Pahlish, but Shannon asked the Facebook Group what colors they would want rereleased for their 5th anniversary. Little Bread and Butterflies was recommended, and I knew I had to get it. It's a highlighter yellow neon with ultrachrome flakes. 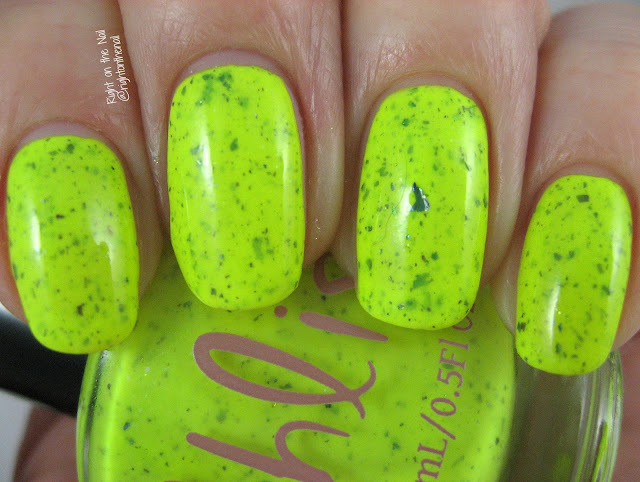 The base reminds me of one of my favorite neon yellows called Yellow Flame from Jessica Cosmetics. If you look at those swatches, please be kind...I posted those swatches 7 years ago and I feel like my blog is now better in every way (content, pictures, etc.). If you don't want your nails to stand out, then this one is probably not for you. It's a bit streaky and sheer on the first coat, but it builds up well in 3 coats. This one is still on sale for $9.00 on the Pahlish website if you're interested. I love it and highly recommend it if you want a new neon color. Find out more about Pahlish on their website, Instagram, and Facebook pages.